You are purchasing a Pitcher and Water Goblet Set, which is available with either 4 Goblets or 6 Goblets. 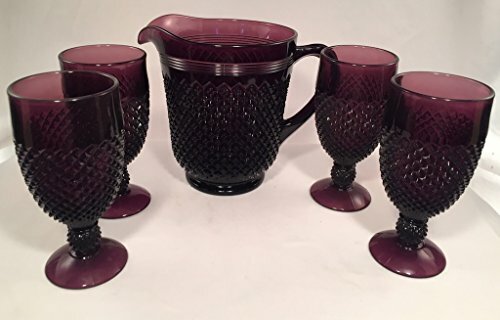 This beautiful Water / Juice / Ice Tea Set comes in a Variety of colors - Amethyst, Emerald Green, Jadeite, Milk Glass, Red or Rose Pink. These sets do not contain lead in them, they are useable. Each set is piece is Hand-pressed into Glass Mold. Handling information: This glassware is all handmade, there maybe small imperfections in the glass. These small imperfections should not be considered seconds or flaws. The manufacture does not recommend glass to be put in the microwave or commercial grade dishwashers.